XML has gained popularity for information representation, exchange and retrieval. As XML material becomes more abundant, its heterogeneity and structural irregularity limit the knowledge that can be gained. The utilisation of data mining techniques becomes essential for improvement in XML document handling. 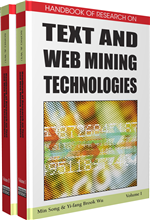 This chapter presents the capabilities and benefits of data mining techniques in the XML domain, as well as, a conceptualization of the XML mining process. It also discusses the techniques that can be applied to XML document structure and/or content for knowledge discovery. The Web is an immense and dynamic collection of pages and services that includes countless hyperlinks, thus, it provides a rich and diversified data mining source. Currently, the majority of this information is in Hyper Text Markup Language (html). html tags are primarily formatting markup and were designed to convey technical reports. Some internal structural information can be inferred from them, (e.g. <h1> indicating important information) but they hold no semantic information regarding content. With an increasingly distributed corporate world and progression to Web 2.0, HTML is considered an inferior means of data exchange. To overcome these limitations, XML (eXtensible Markup Language) uses custom-defined tags to describe the data and the structural relationships of data within a document. XML is a subset of SGML (ISO 8879) and is defined by the World Wide Web Consortium (W3C) (Yergeau et al., 2004). XML tags describe the structural and semantic meaning of information in text documents thus make the XML documents semi-structured and self-describing. XML is rapidly becoming the standard for exchanging and representing data. Many information sources have already or are beginning to structure their external view as a repository of XML documents, regardless of their internal storage mechanism. As XML data becomes more abundant, the ability to gain knowledge from XML sources decreases due to their heterogeneity and structural irregularity. Several advanced data processing techniques are required to retrieve and analyse such large amounts of semi-structured data. Automatic storage of XML documents in the form of relational or object- oriented data has been actively studied by database researchers (Abiteboul et al., 2000) (Lee et al., 2002). Other researchers have successfully stored XML documents in native XML databases (Pardede, 2006). Consequently, several query languages for various XML data sources have been developed (Boag et al.). The use of these query languages is limited, for example, users need to know what kind of information is to be accessed and only limited inputs and outputs are acceptable. Additionally, indexing based on structural similarity and/or based on groupings of XML documents sharing frequent sub-structures are needed to support effective document storage and retrieval (Nayak et al., 2002). Data mining techniques such as clustering (Jain et al., 1999) can improve XML document storage and retrieval by grouping XML documents according to their structural similarity. Computation of structural similarity is also a great value in managing the Web data. Many techniques of extraction and integration of relevant information from the Web data sources require grouping the Web data sources according to their structural similarity (Flesca et al., 2005). Moreover data mining (Fayyad, 1995) techniques allow the user to search for unknown facts, information that is hidden behind the data, and also allow users to pose more complex queries. For example, after identifying similarities among various XML documents using clustering, links between tags within a group of XML documents can be analysed using association mining. This may prove useful in analysis of e-commerce Web documents and subsequently in personalisation of Web pages. There is a considerable body of research on mining useful information from numerical, symbolic and text data (Han & Kamber, 2001). There have been some progress on using XML as a language in data mining process models such as (1) Predictive Model Markup Language (PMML) (Wettschereck, 2001) for utilizing XML to specify several kinds of data mining models, (2) XML based Data Mining Specification Language (XDMSL) for describing the data mining process (Kotásek & Zendulka, 2002) and (3) Log Markup Language for utilizing XML to structurally express the contents of Web server log files(Punin et al., 2001). frequent patterns miningFrequent Patterns Mining: A Data Mining area focussing on the extraction of frequent patterns from a given data. XML frequent patterns miningFrequent Patterns Mining: Mining of XML documents for frequent patterns which are either structural or content-oriented or a combination of both.